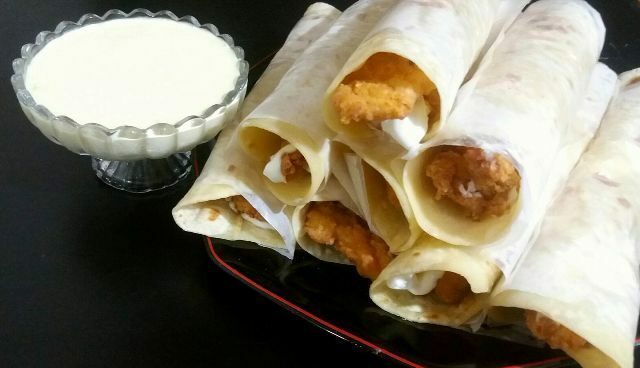 Crispy Chicken Roll Paratha Recipe with Mayo Garlic Dip. Roll paratha is delicious version of meal. Coated chicken has a crispy outer layer, whereas tender and juicy from inside. Rolled in flat bread (paratha) and dash of mayo dip gives it a scrumptious taste. Paratha Roll is my favorite meal but if eat it out, it has too much oil. That’s why I prefer to make it athome. I serve it with tamarind dip or mayo garlic dip. It goes tempting with both. Enjoy lip smacking Roll Paratha Pakistani Food Recipe by Nida Sheikh. Cut chicken in small pieces and flatten a little with kitchen hammer. Marinade chicken with all ingredients and leave for an hour. Now mix together all purpose flour and corn flour in a plate. Coat chicken pieces in flour and deep fry until crispy brown and tender. Mix together paratha ingredients in a bowl. Knead by mixing milk or water gradually. Leave for 10 minutes then make thin rotis. Brush little oil/ghee on both sides. Cook for 1-2 more minutes. In a blender add an egg mustard paste, salt, lemon juice, water, pinch of black pepper powder and blend for 5 seconds. Now gradually add 1 cup oil (olive oil or cooking oil previously kept in fridge for 30 minutes) while keeping the blender on. Blend it for more or less 30 seconds till the mayo becomes little thick. Take it out in a bowl and add finely chopped garlic and mix well and refrigerate for few minutes. Assemble fried chicken pieces on parathas, Pour store bought plain mayo or garlic mayo and wrap. Serve with garlic mayo dip.